Welcome to the ENR2 Self-Guided Tour! 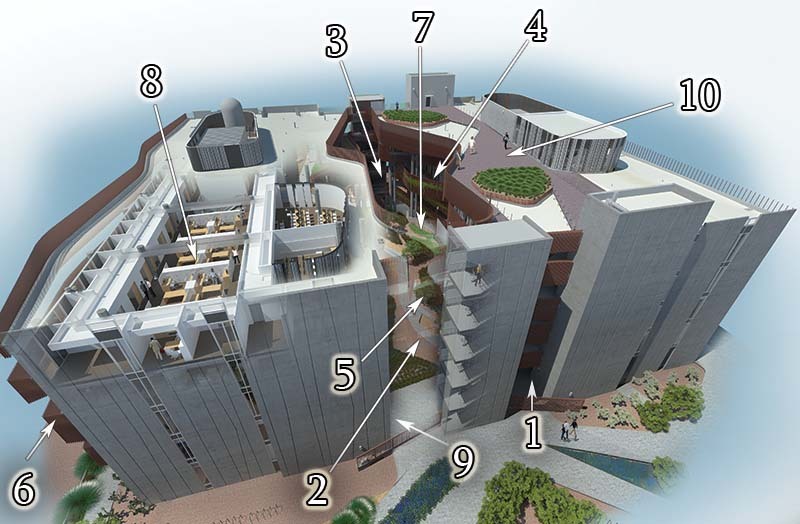 Discover the sustainable features of this amazing building by touring the 10 locations. ENR2 is a premier building showcasing sustainability in a desert environment while fostering connectivity among its occupants. The new Environment and Natural Resources 2 (ENR2) building is a part of the University of Arizona’s commitment to promote interdisciplinary research and studies that focus on earth science, environmental programs and natural resources. 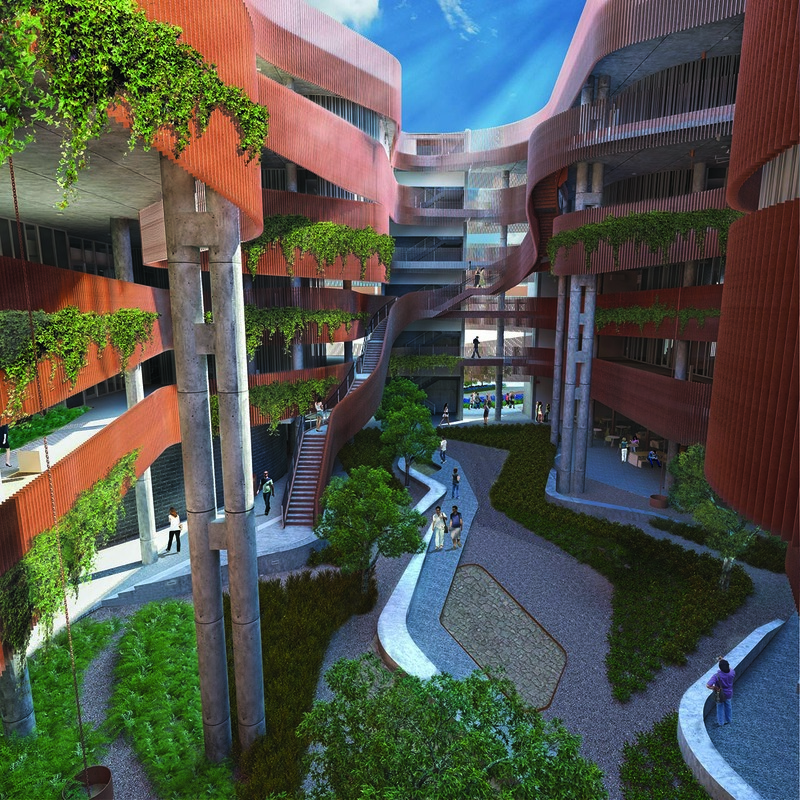 The ENR2 building establishes an atmosphere of collaboration for the Institute of the Environment, School of Geography & Development, and School of Natural Resources and the Environment. The department of Mathematics also has office and teaching spaces in the facility on an interim basis. ENR2’s design expresses not only the functions that occur within, but also the university’s commitment to environmental sustainability and awareness. Sustainable design in Arizona is more challenging than in other parts of the country that don’t face extreme heat and dry climate conditions found in the desert. The ENR2 design team of GLHN Architects & Engineers and Richard & Bauer Architecture explored innovative solutions to architecture in a desert environment resulting in the most sustainable UA building to date. 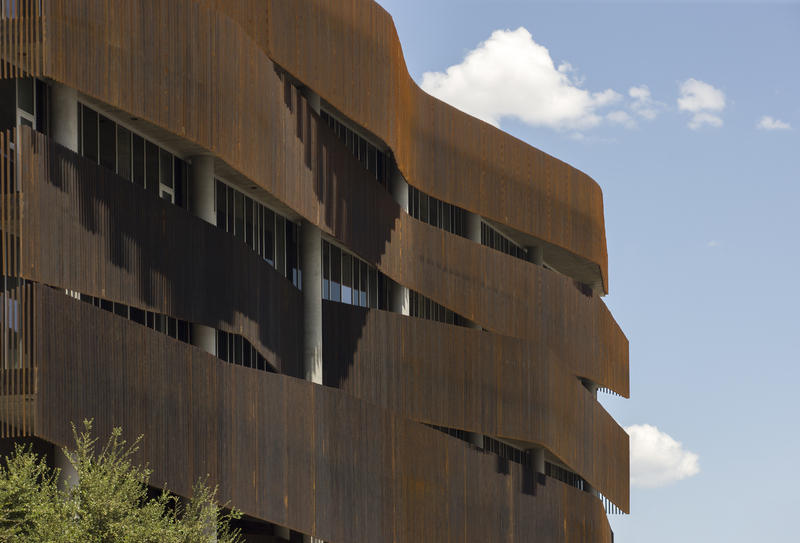 The design of the ENR2 building reflects the environmental mission of its faculty, staff and students with a compelling response to the iconic imagery of the Southwest region and the special qualities of the Sonoran Desert. 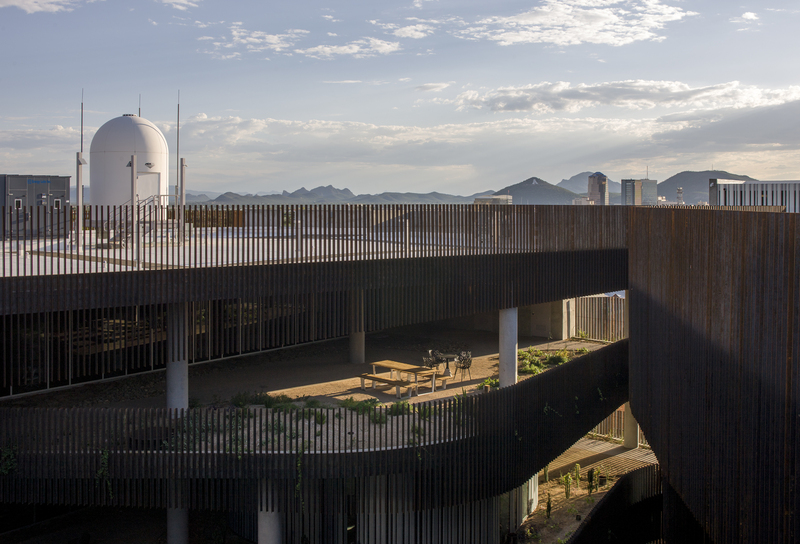 The design mimics the striking landforms of canyons and mesas, the dramatic play of light, shade and shadow, the painted sky of sunsets, desert monsoons and highly adaptive plants. The building’s architecture is inspired by the sustainable features of a slot canyon which is a unique geologic feature in the Desert Southwest. The canyon serves as the building’s centerpiece for circulation and gathering. By creating exterior circulation and interaction spaces and tempering the exterior terraces with shade, planting and fans, the amount of conditioned space is reduced by approximately 30 percent. 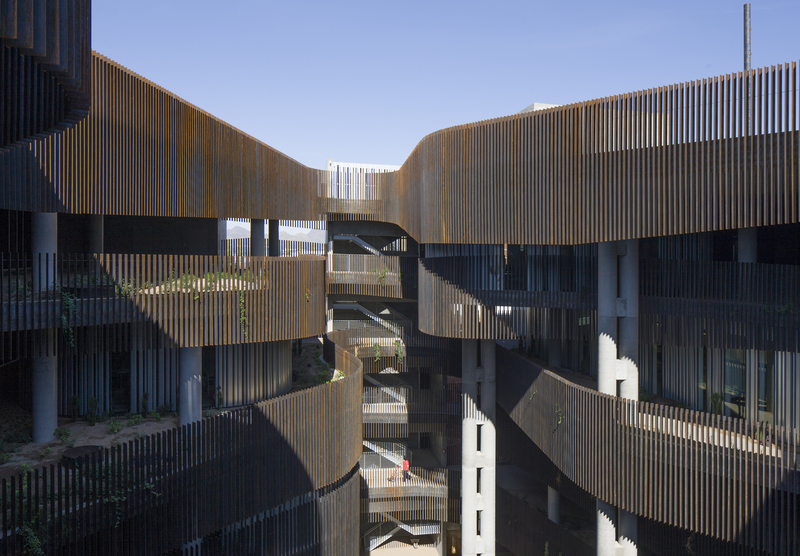 The ENR2 central “canyon” courtyard integrates exterior circulation and interaction space. The metal fins and overhangs are utilized as shade elements within the canyon to create the effect of the curvilinear canyon wall. 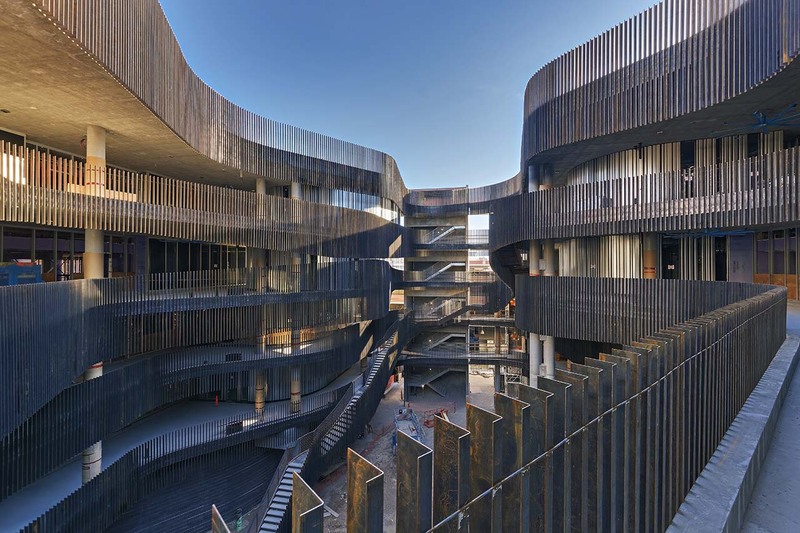 The forms are defined by a contrast of light and dark, capturing the unique flow of the courtyard walls which results in the canyon revealing itself differently at different times of the day and different times of the year – constantly changing and evolving. The east and west ends of the building are open to allow for natural ventilation through the canyon supplemented by fans on the exterior walkway terraces. The building deceptively seems larger than its square footage because of the use of outdoor space that doesn’t have to be heated or cooled except by natural ventilation and the return chilled air discharged into the courtyard to cool outdoor useable space rather than on the roof. The University takes the approach to build durable facilities that last at least 100 years. Low maintenance building materials serve double duty as both functional elements and creative architectural features that portray a sense of grandeur. The exterior fins provide both shade and a striking design element made from low maintenance mill finished steel. The substantial concrete structure and overhangs provide both cool thermal mass and critical shade. Where possible the concrete remains exposed to serve as the perimeter walls and ceilings reducing the need for additional materials such as drywall and paint. If additional materials are required, environmentally responsible materials are incorporated. Although the curved canyon walls provide architectural diversity, most rooms in the facility are typical University size and shape for consistency and maintenance. 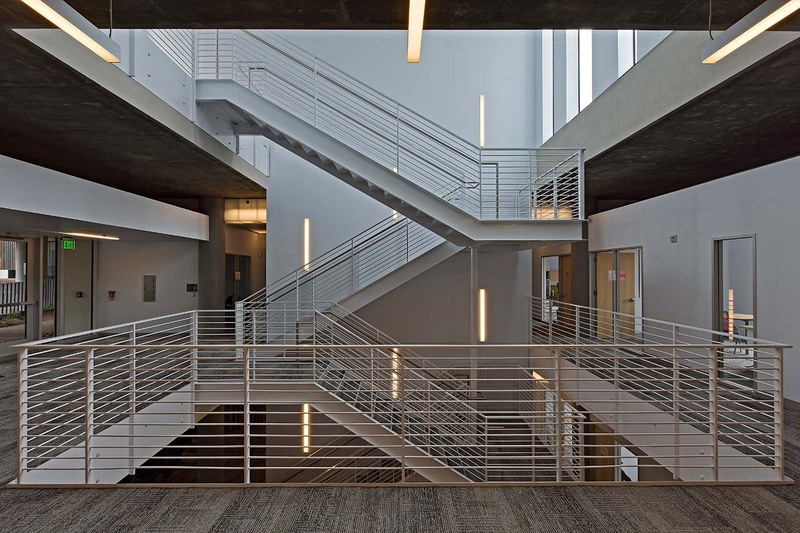 The courtyard design allows natural light to permeate throughout the building. 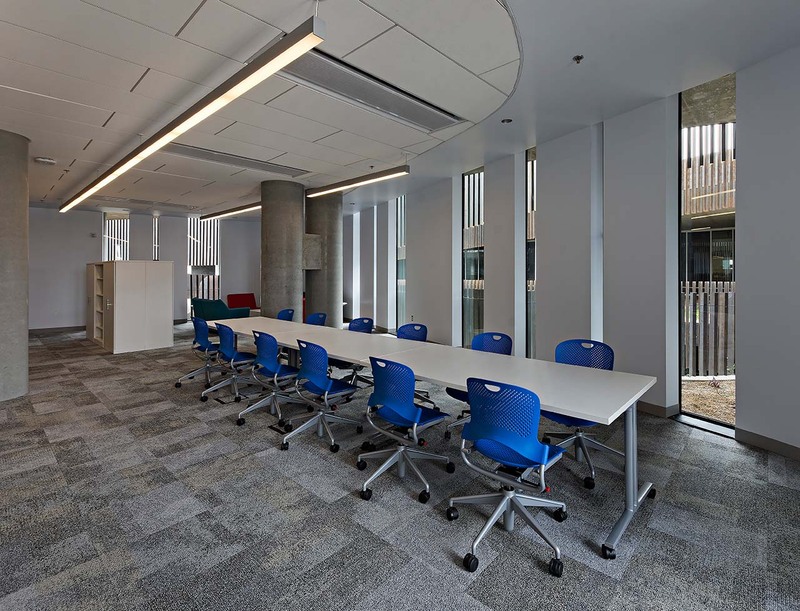 Natural light is everywhere, from the central canyon to the abundant windows in offices, classrooms and public spaces. The building was oriented to be responsive to the light and ventilation provided by each exposure. Maximizing exposure to natural light and views for all occupants and creating a comfortable work environment enhances productivity. The outdoor circulation fosters interaction between the occupants. The south elevation echoes the slot canyon theme of the courtyard. Exterior gray masonry walls on levels 1 and 2 provide thermal mass while evoking lava rock on canyon walls that was integral to early UA architecture. The building is another great example of using ordinary materials in creative ways. The upper floor glass is shaded by overhangs and metal fins, maximizing natural light while reducing heat gain. All four sides of the building respond to their orientation differently. Openings of the east and west are minimized. On the north, without direct sun exposure, openings are protected from early morning and late afternoon glare. There are many sustainable components in the ENR2, both active and passive, with energy and water conservation being an integral element of the building design. Desert rains create temporary and evocative water features as the water drains through each level of the courtyard and around the perimeter of the building. The water will irrigate landscape beds and then flow into the base of the central courtyard to be guided into a 52,000 gallon underground holding/filtration tank located under the building. 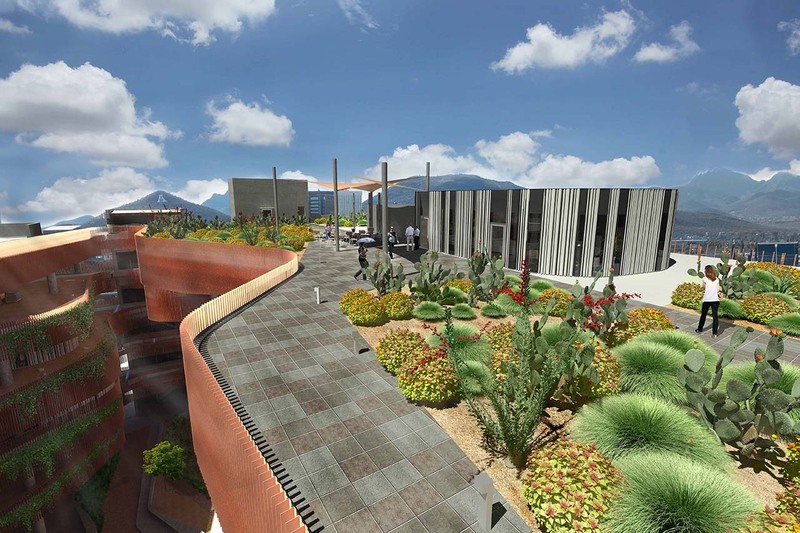 The rainwater runoff along with captured building condensate will be continually reused to irrigate the native trees and plants that populate the desert ecosystem within the building. When harvested water is not available, reclaimed water from the COT/UA reclaimed water system will supplement. The building is stacked to make it interactive and collaborative. The occupants agreed to an open, shared space instead of separate space with dividers. Departments are located on different floors throughout the building, rather than segregated by floor. The vertical space is connected from floor to floor by interior and exterior stairways. The HVAC system design is projected to realize on the order of a 32% reduction in annual energy costs when compared to the defined “baseline” system. While this is the first time that many of the ENR2 heating, ventilation and air conditioning systems have been used on campus, they are tried and true methods that have proven successful elsewhere. The University is not taking chances on untested, cutting edge systems. But it is important to be adaptable and innovative to incorporate these advanced technologies into future designs due to their efficiency and energy conserving potential. A dedicated outdoor air system, combined with overhead induction coils known as “active” chilled beams provide the primary heating, ventilating and air conditioning function for perimeter office spaces on floors 2 through 5. This innovative system substantially reduces fan energy and provides a more accurate method of controlling fresh ventilation air. It functions like a radiator. Chilled water cools the air in the beams while small fans move the air into the room requiring a smaller amount of fresh air and allowing for reduced size of the building’s air handlers in comparison to other buildings. The ENR2 utilizes vacancy sensors – not occupancy sensors to control and adjust lighting and air conditioning in individual offices. The sensors take an average temperature and set the temperature range for a group of offices on the same zone. Natural lighting along with highly efficient light fixtures, light level and occupancy controls reduce electrical power consumption. LED desk lamps provide energy efficient, individual lighting control. Subfloor ventilation systems are used in the open office and classroom areas to provide air at the floor level which is more efficient and closer to occupants than standard air vents in the ceiling. 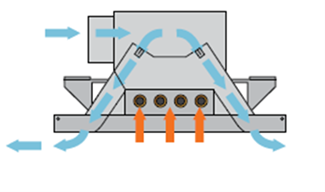 Benefits to this type of buoyancy-driven, low momentum system include high ventilation effectiveness, ability to extend airside economizer operation to an outside ambient temperature of 65 F, and low noise. 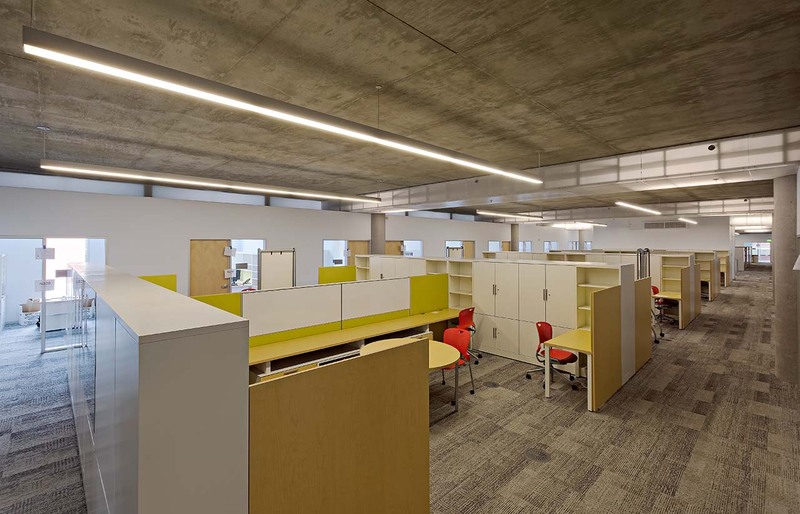 As part of the building’s flexibility, a raised access floor and large open office areas are used throughout the building for power/data distribution in lieu of suspended ceiling tiles and partitions. The raised floor accentuates the flexibility of the building by placing the mechanical, electrical and communications within the floor space. This will facilitate future remodels making them less invasive and more cost efficient. The raised floors inside are complimented by planter depth on the landscaped balconies. Art inlays reflect the environmental theme and programs in the building. The Institute of the Environment commissioned artist Joe O’Connell, Creative Machines, Inc. to create the metal representations of animals, plants and environmental objects to be installed in the concrete walkways in the canyon. There are over 270 pieces depicting 37 different designs. Contact the UA Foundation to contribute to this ongoing fundraiser. The Institute of the Environment's Executive Conference Room will be used for meetings, outreach and special events with the ability to video conference with participants globally. Located on the roof, the room has direct access to the future outreach/research gardens, future solar panel testing arrays and other rooftop environmental research equipment and displays.